Northamptonshire’s 3rd fixture of the Anglian League campaign took us to Gainsborough Golf Club, where we would take on Lincolnshire. One of the league’s strongest opponents and a county where a Northants win is barely in memory. The young squad assembled by Northants Captain was full of talent, tenacity and strength, the best 8 we had fielded since June 2017. With 2 changes from the June fixture, Tom Forster (on summer holidays from his US adventure) and Luis Witherall (GCSE’s now complete) coming into the squad, meeting up with Charlie Salter, Michael Farr, Mikey Chambers, Jamie Milligan, Lee Hitchcock and recently crowned County Champion Liam McNeela. Despite a large absence from the usual Saturday afternoon practise round – only two of this team had not played the course before and it is largely an ‘obvious’ golf course. The weather, as it had been for several weeks now, was very warm and sunny with a breeze that did increase during the day – yet amazingly Gainsborough’s greens were quite soft – this would then be a game decided on accuracy from the tee and then who could hole the crucial putts. The Foursomes matches got underway with Michael Farr and Tom Forster taking on Lincs strongest pairing of Simon Richardson and home member Adam Wainwright – followed by Luis Witherall and Charlie Salter, third out were Mikey Chambers and Lee Hitchcock, leaving Liam McNeela and Jamie Milligan at the back. Throughout the early stages, 3 of the matches were always tight with only one hole in either direction – Jamie and Liam had got off to a flyer and were 3 up through 4 holes. Halfway through the round, this advantage had narrowed to just one up, while Tom and Michael were 2up after 12, Charlie and Luis, and Lee and Mikey all square through 11 – so very tight – as we had expected this fixture to be! Up front, Michael and Tom’s advantage had been cut to 1 up with two holes to play and thanks to a very good birdie 2 at 17 by the Lincs pair the match would go down the last – with no drama, the hole was halved in pars and these two excellent pairs could not be separated. In match 2, Luis and Charlie had were 2 up with 3 to play, they would lose 16 and 17 and were gifted the 18th, thanks to a Lincolnshire 3 putt for a very accomplished 1 up victory. Lee and Mikey were 1 down upon reaching the 16th and despite their best efforts could not gain any of the final 3 holes and would lose their match 1 down. In match 4, despite their early advantage, Liam and Jamie were still holding onto a 1 up lead reaching the 18th hole – all 4 matches playing all 18 holes – without needing to perform any miracles the boys played regulation golf, with Liam holing a 3 footer to maintain their lead, win their match and give Northants a well earned and deserved lead from the morning matches. The afternoon singles got underway later than planned, due to a lunch delay. Though we got the impression the Northants lads appreciated the break from the incessant sunshine and increasing heat. Feeling sure the Lincolnshire order would be packed in the top end, the Northants singles order would be Charlie Salter, Tom Forster, Michael Farr, Lee Hitchcock, Luis Witherall, Mikey Chambers, Jamie Milligan and Liam McNeela. Sure enough, Lincs top 3 were as expected, maybe in a slightly different order than guessed, but all looked set for a series of very exciting matches. Once all 8 matches were on the course, Captain and Team Manager Mike Gilbrook set about catching up with the first matches, after 7 holes Charlie was 2 down, Tom 1 up and Michael 3 down. Clearly, this was going to be an afternoon when all 8 matches were crucial and the guys that were up had to work hard to maintain their advantage, while the guys that were down, would need to work even harder to gain holes back. If the matches had finished after 7 holes Lincolnshire would have won the match by the odd point. Reaching the 11th tee Charlie was still 2 down in his match – Charlie is often best left to own devices, but he knew how important his match was. It would be another 5 holes until we saw Charlie again. On the same tee Tom had improved his score to 4 up, with a mixture of excellent and consistent golf and a couple of gifts from his opponent. Tom would cruise in just 3 holes later, gaining the first point of the afternoon and a solid 6&5 victory! In match 3 Michael was finding it hard to make any headway against Lincolnshire’s best player and remained 3 down after 10 holes. At this point, Lee had got a hole advantage on his match and despite suffering badly with blisters, looked in determined mood. Luis was coasting round the course, looking in imperious form and very relaxed and was 2 up through 10 holes. With the final 2 matches a little way behind, Captain Bott caught up with Charlie, now playing 16 – he had turned his match around from 2 down with 8 to play, to be 1 up with 3 to play!! Northamptonshire’s ‘Postman’, or renamed ‘Back 9’ Salter – is developing a habit for starting slowly…Charlie would win 16 to be dormie on 17 and would not lose the hole to put a ‘W’ against his name in very impressive fashion! By this time matches 7 and 8 had made the turn and were 2 and 1 down respectively. As the matches all remained so tight, we felt that it could come down to the final match, so the Captain reminded Liam of his Anglian League debut last May – where 5 down through 5, he would win his match 2 up and with it the game. Attention now turned to the final 4 holes, where Michael in match 3 was dormie 3 down, but would win 16 and 17 thanks to solid pars and took his match to the last – a miracle fight back against one of the region finest golfers would unfortunately not transpire and a 1 down defeat would be the result – though a fight back that Michael should be very pleased with. 2 points out of those top 3 matches, having a lunchtime lead! Fantastic performance. Though it remained clear that we still required 2 more points for victory and at this stage in the match it was not absolutely clear where these would come from. In match 4 Lee , fighting the pain of blisters, had lost a couple of holes around the back 9 and was 1 down playing the last – not really knowing where to be, the Captain left the experienced player and waited for news…and went back to 16 where Luis was just shaking hands on a very solid and complete 3&2 victory! An excellent performance all day by Luis – it is very easy to forget how young he is – at 16 his manner and calmness on the golf course today was impeccable! Rewarded with 2 wins. The news from the 18th green was excellent, Lee had won the 18th hole to seal an excellent, and at the time, much needed half! Putting us that bit closer to the target…just half a point needed now! 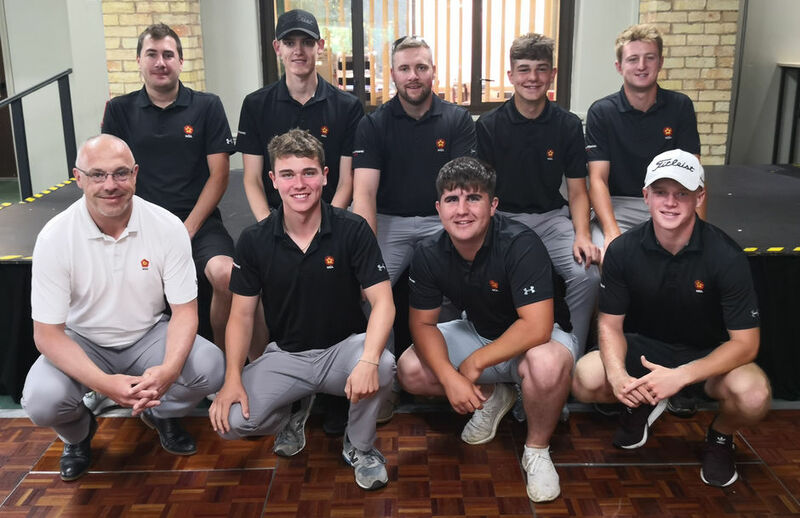 With all this excitement going on, it is very easy to forget the boys at the back of the order – Jamie could not get anything going during his singles match and would lose 1 down and Liam would birdie the 18th hole to seal a half in his match. So the end result would be a comfortable 7.5-4.5 – this does not really do justice to how close the matches were, but it does do justice to this team and the effort they put in to the day. Rewards for some excellent performances on an energy sapping day! I could not be more proud of the guys – and a good way to celebrate Mr. Gilbrook’s birthday! The result still leaves us with a chance of winning the Anglian League, though we require to more wins, at home against Suffolk, then away in Cambridgeshire, and for Leicestershire to be beaten either by Norfolk or Suffolk…fingers crossed! But for now savour this win and enjoy one of the best victories for Northants in a few years!